While we’re still enjoying summer-time weather here in Atlanta, fall and winter are just around the corner. And while the cooler temperatures are nice, with them comes cold & flu season. Antioxidants found in fruits, vegetables & other foods can help us boost our immunity naturally. To get your body ready to fight germs this fall & winter, start now by incorporating more fruits & veggies into your diet. The current recommendation for adults is to obtain at least 2 cups per day of fruit (1 piece of fruit being equivalent to 1 cup), and at least 3 cups of vegetables per day. September is National Fruits and Veggies Month and the Produce for Better Health Foundation’s website makes it easy super easy to find new fun & easy ways to incorporate fruits & veggies into your diet. At fruitsandveggiesmorematters.org, you can find tips for healthy lunches & snacks, quick & healthy 30 minute recipes, and even research on hot topics such as GMO’s. I occasionally hear folks say, “I don’t need the sugar that’s in that fruit.” But there’s a big difference between the good carbs (fruits, veggies & whole grains) and the bad carbs (refined sugars, corn syrup, processed foods & foods made with white flour). The good carbs – fruit does contain sugar, but let’s not freak out yet. 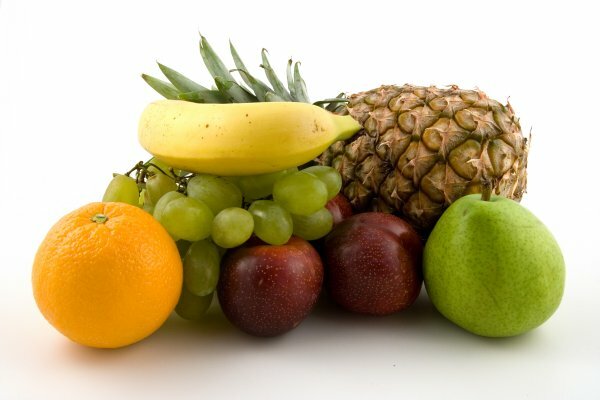 More specifically, fruit contains fructose, which, when eaten, is broken down into sucrose and glucose. Glucose is essential for immediate energy, and any excess is converted into glycogen, which is stored in the liver and muscles for later use. To control the amount of glycogen stored, choose fruits with a low glycemic index (GI) that release glucose into the blood stream gradually. Apples, bananas, grapefruits, peaches, and pears are all good choices. Additionally, fruits & vegetables & true whole grains (we’ll tackle this subject in a later post!) provide the body with vitamins, minerals & fiber. All essential to good health. The bad carbs – refined sugar and corn syrup – are stripped of nutrients and do not give you the added benefit of vitamins, minerals, and phytochemicals that can keep you healthy. Refined sugar can also suppress immune system function, which we want to avoid at all costs – especially heading into cold & flu season. Still have questions on good vs bad carbs? Want more information on the value of fruits & veggies? Ask us in the comments below, and check out some of the articles we used as references when writing this article.